Instead of handling the Checked and Unchecked events of a CheckBox and then setting a boolean variable to represent the current state, you’ll most often just use data binding to bind the IsChecked property to a boolean variable. 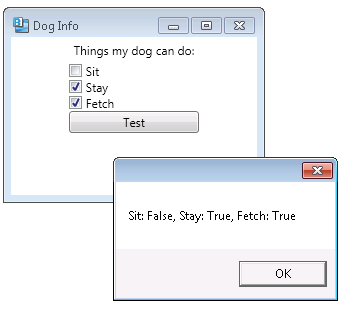 In the example below, we have three CheckBox controls, each bound to a boolean property. In the code-behind, we define the boolean properties that we can bind to and then set the data context to refer to the parent class. Thank yuo for this simple tutorial. What is the simplest way to make this twoway binding? I can’t seem to be able to wrap my head around twoway binding. This example shows one-way binding, from the View to the code. Remember that if you want a change in the code to be reflected in the View, your class will need to implement INotifyPropertyChanged and fire a PropertyChanged event whenever the property value changes. You can’t do this with auto implemented properties, so you’ll need to add a backing variable and implemented the property getters/setters yourself. Example coming this Wednesday that will demonstrate two-way binding to a CheckBox.